Rocket Lab has announced that the next mission of its Electron rocket will bring three satellites into orbit for the Department of Defense’s Space Test Program, Space News reported Wednesday. The launch, scheduled for late April, will demonstrate advanced satellite technologies designed to support future missions of the Air Force and the Army. York Space Systems built the largest of the three satellites, called Harbinger, which will be tested by the Army Space and Missile Systems Defense Command. The Air Force Research Laboratory will send its Space Plug and Play Architecture Research CubeSat-1 aboard the Electron rocket to test modular spacecraft avionics. The third satellite is the Air Force Academy’s Falcon Orbital Debris Experiment, designed to provide calibrated radar and optical targets for ground-based space situational awareness sensors. 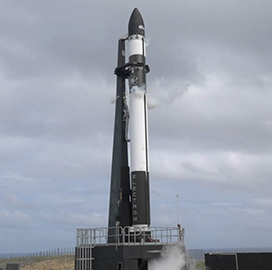 Electron’s upcoming launch, which will take place at Rocket Lab’s launch site in New Zealand, will mark the rocket’s sixth mission.